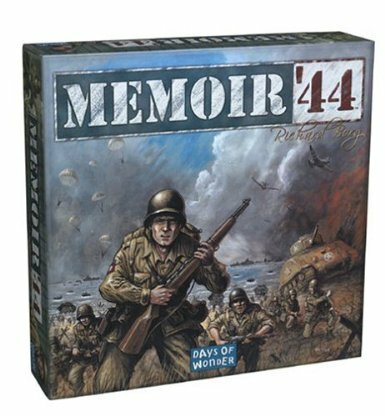 About seven years ago, I picked up a copy of Memoir ’44. This Days of Wonder game is played on a game board that features a beach invasion point on one side and the other side of the game board has a European countryside. The game board has hexes, plastic figures represent your army, and play is determined by cards. Attacks are resolved with six special dice. If you are a “grognard” you will love the feel of the game. Much more simple than a classic war board game, this is the perfect entry game for those who enjoy tactics but don’t want to get caught up in a whole bunch of rules and special situations. I remember playing a game back in 1984 with a couple of my friends. I don’t remember the exact game but it was based on WWII in Europe. Specifically, I remember one situation where my two friends argued about some obscure rule for nearly three days. We never did finish that specific game–it was just all too much and by the time the rule was finally resolved everyone was so mad that we never finished the game. You will never have this type of problem with Memoir ’44. The rules are simple, play is fast, and the tactics involved are surprisingly enjoyable. Turns are taken in the classic IGO-UGO style. Although some of the different scenarios are somewhat unbalanced, this can easily be resolved by having each player take a turn with each “side” of the scenario. Then results can be compared as to who won in the most impressive manner. Most of the scenarios take around 30 minutes. This is definitely a game that young players will enjoy. I played with my son several times when he was 10 and he understood the game completely. In fact, we were evenly matched for the most part. This is a game I will definitely recommend to you if you enjoy Axis and Allies or are just looking for a good tactical war game that doesn’t demand endless hours or reading to understand all the different nuances of the rules. Quick, fun, and high replay value all combine to make this the kind of game everyone should have on their game shelf. Check it out, it is one of my top twenty games.